It started with a letter to oppose the ritual slaughter of a pig as part of a Vietnamese Lunar New Year tradition - it ended with Vietnam’s government clamping down on ALL cruel festivals. Staff at Animals Asia’s office in Hanoi have seen nothing like it. Their opposition to the Nem Thuong Pig Slaughter festival has become a huge issue in Vietnam and the media were constantly in touch. First opposed late in 2013 - over 60 articles were to appear in the Vietnamese press in 2014. A year later that had risen to 160 including coverage right across Vietnamese TV - including VTV1 and HanoiTV. Among the media there was an online poll from VnExpress - showing 79% support from the general public (below) to end such cruelty. February 2015: A Member of Congress suggested that festivals that hurt animals be banned. March 2015: Minister and Government Office Chairman suggest elimination of rituals “not suitable in a civilised society"
By February 2016, the government had started to put their objections into law with the Prime Minister issuing a “public order” document which specifically outlines the stopping of animal sacrifice and cruelty. Then the Minister of Culture, Sports and Tourism issued a circular rejecting cruel rituals “which are no longer suitable”. 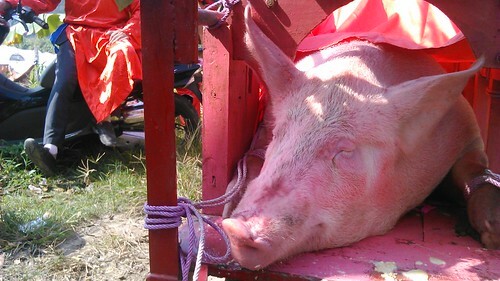 Scheduled ahead of new government demands - the Nem Thuong Pig Festival went ahead but tried to appease politicians and the public by making the killings in private. It was a move that showed the campaigns were having an effect but Animals Asia has vowed to continue to fight the cruelty. Meanwhile the “buffalo stabbing festival” in Buon Don, Dak Lak was reported as finishing although again there were reports of a more private, less horrific sacrifice. But in Phuc Tho (Hanoi), Phu Son (Bac Ninh province) and Bao Thang (Lao Cai province) - buffalo fighting in festivals were stopped.